When it comes to storing energy at the scale of the power grid, lithium-ion batteries have a lot of advantages -- and, critics say, some significant drawbacks. Sure, lithium-ion is the dominant battery chemistry for consumer electronics and electric vehicles, which helps drive down costs and improve bankability for grid projects (see Tesla’s Giga factory for an example of how this future could unfold). And yes, they’ve been proven in many grid-tied projects around the world. But there are two questions that continue to dog the potential for lithium-ion batteries at grid scale. Can they provide hours of energy at a time to serve grid needs, and can they last for the decade or more required for cost-effective grid use when they’re being discharged so deeply, over and over, day after day? Chris Shelton, president of AES Energy Storage, wants the utility industry to know that the answer to both questions is an emphatic "yes." While most of his company’s nearly 200 megawatts of lithium-ion grid storage projects are serving short-duration power needs like frequency regulation, nearly half of its roughly 1,000 megawatts of projects under development fall into the “long-duration” category, capable of providing energy for two to four hours, he said in an interview last week. “We can do a two-hour product at less than $1,000 a kilowatt,” Shelton said. At that cost, “we’re less expensive than a gas-fired power plant,” the traditional generation source for meeting the grid’s peak energy and ramping capacity needs. 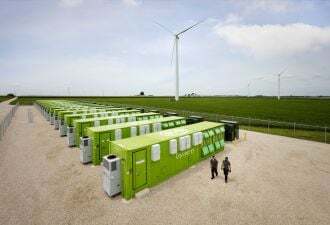 That cost also beats out current long-duration storage alternatives like sodium-sulfur batteries and flow batteries, even if emerging battery technologies are claiming they’ll go even lower in cost in years to come. But hitting the right dollar-per-kilowatt cost is only the first step for grid-scale storage. Figuring out what the cost of that battery’s discharge capacity will be over its operating lifespan is a much tougher challenge. That per-kilowatt-hour cost can vary widely -- and much depends on how it’s used, not just how it’s built. Many skeptics believe that lithium-ion batteries may be technically unsuited to cost-effective use for multi-hour storage. Even systems that can overcome these technical challenges will have to provide a real-world track record to prove to financing partners that they’re a safe long-term investment. Doing things this way helps to manage technology risk for utilities and other customers, and “it also allows the customer to compare it to another offer from a peaker plant,” he noted. This is similar to the way most power plants are contracted today, and “that’s why we offer them that way -- because it’s what people are used to.” As a subsidiary of AES Corp., which has $42 billion in energy assets, AES Energy Storage has plenty of experience in this world. For natural gas-fired power plants, the cost of natural gas is the main variable cost, but ongoing operations and maintenance costs also play a role. AES’s variable costs for battery-based multi-hour storage will remain lower than those for gas-fired peaker plants, he said. And while cheaper gas could flip that equation, he estimated that prices would have to fall to less than half what they are today to make that the case. In the meantime, lithium-ion batteries are only getting cheaper, driven by economies of scale for the consumer electronics and EV markets. “It’s proven itself today, and proven itself at scale -- and the companies providing it are some of the best around,” like Panasonic, LG Chem and Samsung, to name a few. 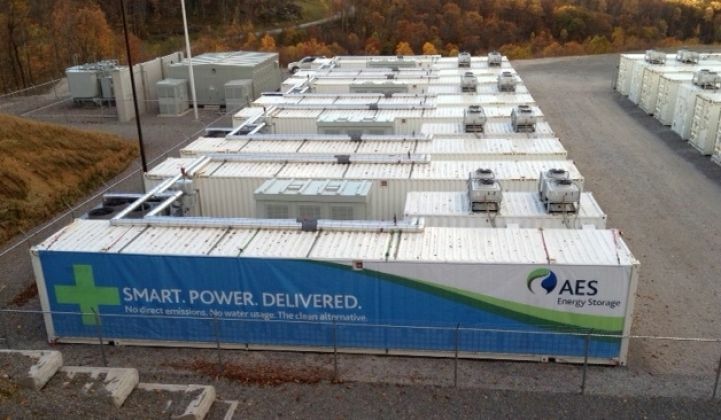 AES Energy Storage is putting its money where its mouth is on this point. In March it launched its Advancion business line, which is integrating lithium-ion systems from LG Chem and other as-yet-undisclosed partners, in hopes of replacing gas-fired peaker plants for grid capacity services. It has also built its own Storage Operating System software to manage these multiple variables throughout the lifespan of a storage system. AES isn't the only company proposing lithium-ion batteries to meet this need. A123 Energy Solutions, the grid-scale arm of lithium-ion battery manufacturer A123 which was bought out of bankruptcy by China's Wanxiang and sold for $100 million to Japan's NEC in March, has launched a long-duration storage system that it has deployed in Spain and Japan so far. There's little doubt that many other lithium-ion battery manufacturers and their partners are working along similar lines. The market potential for storage that can provide hours of capacity could dwarf those for shorter-duration grid services like frequency regulation, where lithium-ion has played its primary grid role so far. Mid-Atlantic grid operator PJM procures about 6 gigawatt-hours of this grid frequency balancing per year, and as of last year, AES Energy Storage’s battery fleet provided about 1 gigawatt-hour of that, he said. But the global market for replacing gas-fired peaker plants is some twenty to 40 times larger, with about 30 gigawatts added per year to keep up with global population growth and rising demand. One of the biggest potential markets is California, where regulators are asking the state’s major investor-owned utilities to procure 1.3 gigawatts of grid-connected storage by 2020. While the state is still working out what share of that will require multiple hours of capacity, it’s already at work on new rules for flexible, multi-hour grid resources to help it manage the disruptions that come from the increasing share of solar and wind power on its grid. What about the next generation of long-duration energy storage technologies? We’ve seen a host of startups seeking to deliver major breakthroughs in long-duration batteries, from next-generation flow battery chemistries from the likes of EnerVault, Imergy and UniEnergy, to aqueous electrolyte-based batteries from Eos Energy Storage or Aquion, or the liquid metal battery being developed by MIT spinout Ambri, to name some key contenders.